Allison: One of the two firms that developed Pearland was the Allison-Richey Suburban Garden Company. Why Allison got a street named for him in what was called “an agricultural Eden”; and Richey did not, remains a mystery. Baker: The Baker family were large land owners in Baytown in the early part of the 20th century. This road dead ends (no pun intended) at the Baker Family Cemetery. Baltimore & Ohio: Started in 1828, this railroad ran from Baltimore, Maryland to its terminus on the Ohio River at Wheeling, West Virginia. Bayport: This boulevard leads into the massive Bayport Industrial Complex. Currently many large facilities are located there including Gulf Coast Limestone, Dixie Chemical, Arco, Lubrizol, Petrolite, Goodyear and Rohm & Haas to mention a few. Bayport is soon to begin a major expansion phase that will add a container facility as well as a cruise ship terminal. Beckendorf: This German family was a landholder around Bear Creek in west Houston. In 1945 the Beckendorfs and 40 other families were forced to move due to the construction of the Barker Reservoir, a flood control project in the watershed of Buffalo Bayou. They resettled near Tomball were family members are buried in the Beckendorf Cemetery. Berry: James – This Kentucky gentleman came to Texas to fight for independence in 1836. He was a lieutenant at the Battle of San Jacinto. In 1840 Berry acquired some acreage in northern Harris County where this road is located. He entered politics and held the office of justice of the peace and treasurer of the County from 1845 until 1858. Berry Elementary School is also named for him. Birdsall: The Hogg family and their friends, Judge and Mrs. Frederick C. Proctor, hired Birdsall P. Briscoe and John F. Staub, as associate architects to design their respective homes, Bayou Bend and Dogwood, which were next door to one another and shared a common driveway onto Lazy Lane. The architects divided the work between themselves: Staub designing Bayou Bend and Briscoe designing Dogwood. A plaque on the wall facing the Diana Garden at Bayou Bend memorializes this collaboration. Boone: Sylvester – This gentleman arrived in Alief, Texas in 1908 (see Alief-Clodine). Boone along with A. J. Martin and S. A. Brasfield were responsible for establishing an independent school district here. In 1910 the first school opened. The Boone clan has lived in the area for almost a century. Boone Park and Boone Elementary School also are named in their honor. In June 2006 the Alief Old Timers Group hosted a reunion presided over by 104-year old Mora Boone who moved to Alief in 1921 to marry James L. Boone Sr.
Borgestedt Cemetery: The family settled in the area along Cypress Creek. Many are buried in this graveyard off Huffmeister Road. Johann Peter Borgestedt was born in 1826 and died in 1891. Descendents interred here include Peter (born 1867), Benjamin, Bernice, Anna and Alma. The cemetery is still in use with the latest burial I noted dated 2005. Brahman: In the western themed neighborhood of Southfork near Pearland a number of streets recall cattle breeds including this one. They originated in India. Due to centuries of inadequate food supplies, insects, parasites, diseases and extremely tropical weather the breed developed an ability to survive under very adverse conditions. They were shipped to the U. S. in 1849 and soon arrived in Texas where conditions were somewhat similar to those of India. The beast is easily recognized by the large hump over the shoulders and neck. Buckingham: Located in a neighborhood with English street names, it is most likely named for Buckingham Palace in London. Built as a house in 1705 for John Sheffield, the duke of Buckingham, it was converted into a palace in the 1820’s. Since that time it has been the principal residence of the reigning English monarch. Today it draws huge crowds of tourists to witness the pomp and circumstance of the changing of the guard. Burton Cemetery: This family were early settlers in far west Houston. Many of them, as well as members of the Mathis family for whom Mathis Road is named, are buried in the Burton Family Cemetery at the end of the road. Carnarvon: George Edward Stanhope – Its location in the Sherwood Forest addition leads me to believe this street is named for the British archeologist who was the patron of Howard Carter, the man who found the tomb of King Tutankhamen on November 4, 1922. Carnarvon died from an infection he contracted shortly after opening the sarcophagus, prompting the legend of the mummy’s curse. Carter: Oscar M. – He was a self-made millionaire from Nebraska who brought his utopian vision for a 20th century town to Houston. He created the Omaha and South Texas Land Company that purchased 1,756 acres on the highest point in the area northwest of downtown. Calling it Houston Heights, the corporation invested $500,000 in infrastructure including utilities, parks, schools, landscaping, streets and alleys. Charpiot: A family with this surname lived in the Humble, Texas area in the mid-1800s. Because of the unusual name and the fact this street is located about four miles southeast of that town, I believe it could be named for this family. Cougar: Abutting Cy-Fair Stadium, this short street is named for the mascot of Cypress-Creek High School. The two connecting streets, Bobcat andFalcon, are the mascots of Cypress-Fairbanks High School and Jersey Village High School, respectively. Dagg: Garrett – This man settled in the area near Pearland in the late 1800s. The Dagg Family Cemetery is located on this road. Davis: League City was once the site of Davis Auxiliary Army Airfield #3. In 1942 near what is now the intersection of Marina Bay Drive and FM518, this field was used to support flight training at nearby Ellington Air Force Base. It was one of several of these auxiliary airfields around Houston during World War II. It was closed in 1946 but the runways were still visible in 1976. However, all traces of the base disappeared over the next 20 years as South Shore Harbor was developed. Ding-An-Sich: This oddly named Liberty County drive is German for “a thing in itself.” It is a notion in the philosophy of Immanuel Kant. A “thing-in-itself” is an object as it would appear to us if we did not have to approach it under the conditions of space and time. For more information on this obscure subject see his classic works Critique of Pure Reason (1781) and Critique of Practical Reason (1788), in which he put forward a system of ethics based on the categorical imperative. Dr. John E. Codwell: He was one of Houston’s greatest black educators. HISD valued his skills so highly they waived the retirement age policy so he could continue his service for another decade. Among the positions he held were coach, assistant principal and principal at Phyllis Wheatley Senior High School and principal of Jack Yates Senior High School. Dow: Dow Chemical Company was incorporated in 1897 by Herbert H. Dow to produce bleach. Along the way the product line expanded to include chlorine, ethylene, anti-knock gasoline, polystyrene, Saran Wrap, measles vaccine, Ziploc bags and compact discs to mention a few. The company has a large presence in the Ship Channel town of Deer Park. Driscoll: Years ago the Driscoll family owned a large dairy farm where Montrose and this street are today. The vintage family farmhouse was just razed in 2004 to make way for a townhouse complex. One of our city’s grisliest murders took place at 1815 Driscoll on June 20, 1965, Father’s Day. Three days later Houston homicide detectives discovered the neatly butchered bodies of Fred and Edwina Rogers in the icebox of the home. The crime has never been solved but their mysterious son, Charles, remains the chief suspect. No one has seen him for more than 40 years. Learn more about this heinous crime by reading The Ice Box Murders by Hugh and Martha Gardenier. Duessen: Alexander – This Lake Houston area street is named for a petroleum geologist who donated 309 acres of land in 1956 to Harris County for a park that also bears his name. Eagleton: Barrett Station is a black community off U. S. 90 that sprang up during Reconstruction. The Eagleton family are landowners in this small town. Easy Jet: We love our horses in Houston and this street recalls another one. He became a legend in quarter horse racing circles. As a two year old he was loaded into the starting gate a staggering 26 times and won 22 of those races. For his effort he was named World Champion Quarter Running Horse. A year later he won the title of World Champion Racing American Quarter Horse. Easy Jet retired with a record of 27 wins, 7 places, 2 shows and 2 out of the money in his 38 race career. Eggling: Henry – All of this area in west Harris County was originally part of the George survey. In 1859 this gentleman bought 480 acres from Patrick George and Darius Gregg (who had acquired the land in 1838 from a gentleman named Toliver). Eichwurzel: Sam – Located just east of the intersection of I-45 and Loop 610 near the banks of White Oak Bayou, this man was a land owner here in the 1890s. Other residents of the area were the Sharman family for whichSharman street is named. Members of both families are buried in the cemetery on Enid. Englewood: Leading to the large railroad yard of the same name, both derive their names from the Southern Pacific Rail Road’s Englewood Yard in Chicago. Evans: W. L. – This gentleman developed Riverview on Houston’s southeast side. The neighborhood was located east of Telephone Road and south of Braes Bayou where this street is today. I believe he named the street for himself. Farish: William Stamps – He was born in Mississippi in 1881. His granduncle was Confederate States of America president Jefferson Davis. Farish earned a law degree but soon fell under the spell of the oil business and moved to Beaumont to drill in the Spindletop oilfield. In 1917 he and others organized Humble Oil & Refining Company (now Exxon/Mobil). Farish eventually was named chairman and president of Standard Oil Company of New Jersey. He was a great aficionado of polo and stabled his ponies where this Memorial area lane is located. Farm & Ranch: This Bear Creek Park road leads to the Farm & Ranch Club, an organization that promotes agriculture and ranching in the area. Founded in 1947, the club awards scholarships as well as makes their facilities available to youth groups including Boy and Girl Scouts, 4-H, FFA and FHA. Football: As far as I can tell this is the only area street named for a sport. It leads to Turner Stadium on the campus of Humble 9th Grade School. Gammage: T. E. – Golfcrest, where this street is located, was a T. E. Gammage & Co. development. Gears: John – This German immigrant owned a farm north of town where this road is located. Following his death his heirs continued the operation. George Altvater: He is credited with establishing the hugely successful Barbours Cut Container Terminal on the Houston Ship Channel. Altvater arrived in Houston in 1959 and was named Director of Trade Development for the Port of Houston. He retired in 1979 having served as the Port’s Executive Director for the previous eight years. Gifford Hill: The Gifford-Hill Pipe Company was formed in 1931. It manufactured concrete pipe for sewer and culvert construction. Today it operates 12 plants in Texas (including the one for whom this street is named), Arizona, Oklahoma and Louisiana. It is now owned by Hanson Pipe & Products, the largest producer of concrete pipe and precast in North America. Gillette: Located in the Fourth Ward, this neighborhood, Castania Addition, was developed by Frederick & Gillette. Golden Spike: On May 10, 1869 at Promontory, Utah the rail lines of the Union Pacific and the Central Pacific joined creating the world’s first transcontinental railroad. This tremendous engineering feat was celebrated by the driving of a golden spike. Goedecke: This is another German immigrant family who settled in the Spring, Texas area in the late 1800s. Five family members (Dora, George, George Jr., Katie and Sophie) are buried in the nearby Budde Cemetery. Hargrave: North of downtown and east of the Tomball Parkway is where the Hargrave and Hilton families purchased land in the 1860s.Their family cemetery is located in a grove of trees near here. Henry Shreve: This gentleman played an important role in the development of steamboats. His designs proved to be more technologically advanced that those of the more famous Robert Fulton. Captain Henry Miller Shreve, commanding a battalion of U. S. Army Corps of Engineers, cleared a 180-mile long raft of debris that clogged the Red River. The project took five years (1833-1838). This feat allowed the 1,600 mile river to remain navigable until 1914 when it began silting up. Dredging ceased due to the rising use of railroads to move goods. In 1836 a town at the junction of the Red River and the Texas Trail was named Shreve Town in his honor. Three years later it was renamed Shreveport (Louisiana). Hereford: In a pastoral neighborhood just south of Pearland a number of the streets are named for famous breeds of cattle. This breed was developed in Herefordshire, England 250 years ago. It arrived in the U. S. in 1817 when Henry Clay of Kentucky imported a herd. It is mainly raised for beef. Herridge: The neighborhood where this street is located was called Oak Ridge in the 1930s. It was developed by Herridge & Company. Hilshire Grove: This street is in Hilshire, one of the six incorporated Memorial Villages. A local landowner, Frank Bruess, named the Village for an English country estate. Holly Hall: Located near the Astrodome, this street leads to a retirement community of the same name. 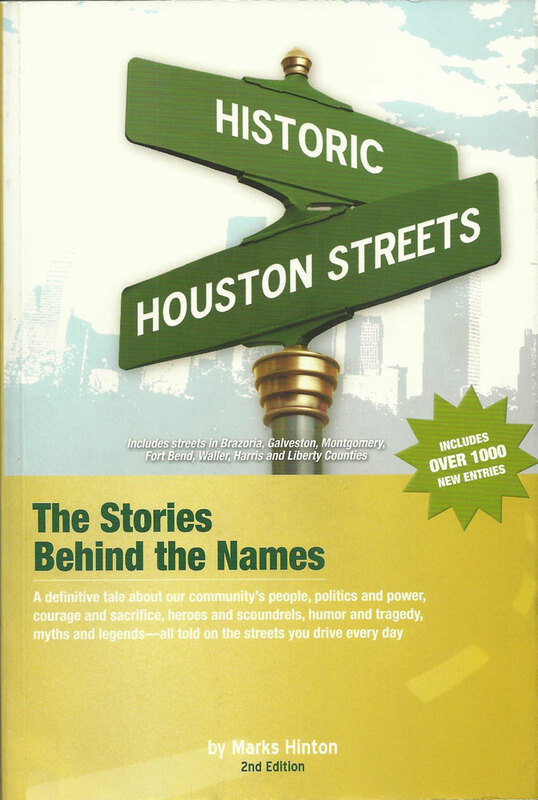 Holmes: H. H. – I believe this road located east of 288 South Freeway is named for this land developer. In 1912 Holmes purchased acreage here and named it Sunnyside. He marketed the development to blacks. Holmes platted lots and built homes that could be purchased for as little as $10 down and $10 a month. The first black woman in Texas to earn a private pilot’s license lived here. Holy Rood: The story behind this Memorial area street is very interesting. The old English word “rood” means “cross.” So this street is named for the holy cross Jesus was crucified upon. One of the earliest poems in the English language, possibly written by Cynewulf in the 8th century, is titled “The Dream of the Rood.” The plot tells of the crucifixion from the viewpoint of the cross. It is forced to be the instrument of Christ’s death. The cross suffers nail wounds, spear shafts and insults as did Jesus to fulfill God’s will. Holzwarth: Many immigrants from Germany settled in the Spring, Texas area during the mid to late 19th century. A number of them are buried in the Budde Cemetery there including seven members of the Holzwarth family (Amelia, Charles, Christian, Katharina, Rosa, Matilda and William).